The latest album from Canadian singer/songwriter Paul Kloschinsky, Crime of Passion, continues burnishing his reputation as one of the finest singer/songwriter talents working in today’s indie scene. He’s a poet and recognized photographer who brings both a literary and cinematic aspect to the songwriting that’s welcome and artfully included. Kloschinsky sports a number of influences, but they are clearly filtered through his own personality; he has a traditional aura, but there’s a thoroughly modern slant to his writing that never leaves his music spinning in some sort of cultural backwater. Crime of Passion is an eight song release with a number of tracks demonstrating his willingness to stretch out both as a musician, songwriter, and vocalist. There’s excellent balance on the album, however, and a number of the songs are focused and aim at appealing to the broadest of all possible audiences. 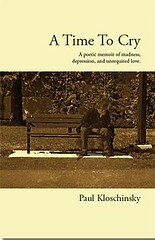 he jangling acoustic churn of “I’m Still Waiting” doggedly embodies the same wanting Kloschinsky depicts in the lyrics. There’s a slightly ominous edge to the guitar figure, but it’s nothing that Kloschinsky pushes too hard on the audience and his facility with the instrument is obvious. There are some light string touches and stripped back drumming further fleshing things out, but the center of the song is his voice, tempered with some echo, but still every bit as hard charging as the arrangement. The title song takes a much more gradual pace and trods, perhaps, more familiar lyrical ground than the opener but it’s still a finely tuned track that makes great use of its language and strikes just the right musical note. “I Believe” has an exuberant pop bounce with some understated horns and lyrical content that, despite being constructed around a central phrase, branches off into a number of interesting directions. The album’s second longest song “House Up on the Hill” is, arguably, Kloschinsky’s finest moment on Crime of Passion. The meandering near-country folk vibe is joined by a recurring woodwind touch bringing an added lonesome quality to the song that makes for a good match with Kloschinsky’s voice. The narrative qualities of the lyric are quite strong. “A Poignant Point in Time” seems to share many similarities with earlier songs, but there’s a surprising rock spirit discerning listeners might hear lurking just beneath the vocal. It’s also the album’s shortest track yet sounds complete and remarkably fuller than its sub three minute running time might indicate. The finale “Gates of Heaven” runs a little longer than the aforementioned “House Up on the Hill”. It begins with an ornate but evocation organ introduction before segueing into another striking Kloschinsky guitar figure. It has a steady mid tempo pace and some sharply observed lyrics that explicate as much as they obscure. It is an truly impressive and weighty curtain for Paul Kloschinsky’s finest song collection yet. It has a decidedly low key, restrained vibe – but bristles with intelligence and musicality impossible to deny. Crime of Passion will draw in anyone who appreciates sharp and thoughtful artistry.